Highly recommend staying here! The staff is amazing (especially Maya and Anine!) and the hostel is clean and comfortable. 10/10, highly recommend if you want a social atmosphere and to have fun events planned daily. One of the most fun hostels I’ve ever stayed at. 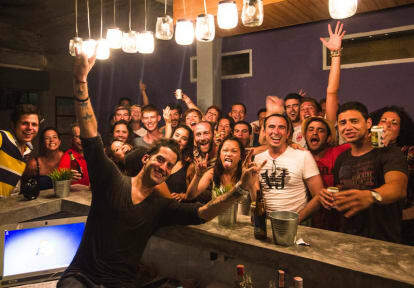 If you’re looking for one of the best party hostels, this is it! The staff was absolutely amazing, AC in the rooms at all times, and the best atmosphere! Would definitely recommend staying here. Great party hostel - exactly what you would expect from the Thailand party hostel scene, and the best choice for the Ao Nang hostel crowd. They meet you with free shots in your room right before going out, very inclusive, and EXCELLENT STAFF. Spicy, Jamie, Anthony, and Charlie were the homies. Amazing hostel with incredible staff. They made sure everyone was having a great time. Maya was amazing on the pub crawl and boat tour. Loved my stay at Slumber Party Ao Nang! Beds were great and the staff was too. James and Maya did a great job of helping guests with any problems and also with having a good time. Definitely would recommend! We had a great time at Slumber party. Special shout out to Maya for making the trip awesome and super fun! Her and she rest of the group really make you feel welcome and want to be sure you have the best time. Would happily come back! Loved this hostel! It's super sociable and have events planned everyday. I was here for Songkran and I have never had such a fun day and that was all thanks to Slumber as they had a day full of activities. All staff were friendly but just to mention James, Anine and Hulk - they were super helpful and really got the party started! Please be aware before you book this ‘party’ hostel that all the partying happens at a different slumber hostel that is a shuttle ride away or a 25 minute walk. We were not the only people who felt really in the dark about what was happening in the night, the staff made nothing clear! To the point that my sick friend got the shuttle to the free bbq and then had no way to get back and rest. Furthermore there is NO space for any of your stuff!!! 1 bathroom is shared with 24 people.